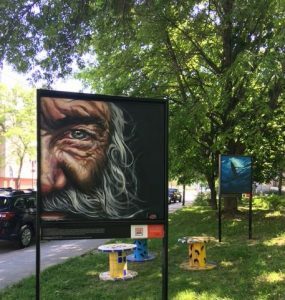 "Connexe Gallery" is an open-air art gallery presented by the SDC - Les Quartiers du Canal and a real extension of our Art Galleries located on Notre-Dame Street West, William Street and to Atwater Avenue. 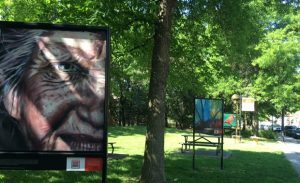 The Parc des Meubliers has unveiled on May 25th 2018, its new artistic face thanks to the initiative of the SDC – Les Quartiers du Canal : the Connexe Gallery. Eleven talented Montreal artists selected by our Art Galleries, have made 18 live art works using different techniques (pencil, ink, watercolor painting, oil, acrylic, spray, photography, …). They participated for 2 days in the creation of the “Connexe Gallery” as a place of artistic diffusion. This ephemeral Gallery comes with a new street furniture to design a meeting place and create a relationship between residents, Montrealers, and visitors with our art galleries. The works of the “Connexe Gallery” will be exhibited at the Parc des Meubliers until October 2018. Nancy Overbury : impressionist artist from Quebec who works acrylic in thick layers on wooden panels. She draws inspiration from the history and landscapes of Quebec. Chloé Sabourin : Thirsty to create and discover new artistic techniques, Chloe continues to develop her own style and find new projects to enrich the Montreal art scene. Atalante : His exploded and recomposed representations of the universe, at once realistic, fluid and refined, reveal the fleeting image of his dreams and yours perhaps. Contemporary muralists and portrait painters Lacey Jane and Layla Folkmann work exclusively as a duo, producing more than 50 murals across Canada from a 4,000 square foot farm silo in the Ontario countryside to the remarkable Rogers Place arena. in downtown Edmonton. They have also created murals in Honduras, France, and northern Uganda. They are currently working in Montréal, Québec, where their practice is dedicated to their collaborative efforts in exterior murals and the development of their own studio practices. His multidisciplinary approach, which reveals unsuspected spaces of passage between painting, photography, and video, is at the origin of Montréal Télégraphe: the iconographic sound (2000); the project where art and science are in constant dialogue and for which he is curator with Louise Provencher. The works of the artist and photographer Paul Emile Rioux propose universes on the border of abstraction and figurative. These projections energize the gaze, inviting him to determine if what he sees belongs to the real or the imaginary. With his singular approach, Paul-Émile Rioux is one of the most innovative artists in terms of digital creations and one of the rare creators to combine aesthetic research with critical posture. Roxanna Kibsey : She works with oil, acrylic, and watercolor. His favorite themes are landscapes and still lifes. She is inspired by her travel experiences, in the northern Quebec area where she grew up, and the classes she gave to children. Roxanna was one of the founders and president of the Monkland Village Artists’ Association and is now a member of the Montreal Art Center in Griffintown. José Carlos Valencia is an artist in visual art, his work is inspired by his visual world, the tradition of Western philosophy, the culture and socio-politics of Latin America and the Age of Enlightenment. Its goal is to introduce the philosophical and artistic themes of Illustration into contemporary art by exploring places, techniques of classical art, contemporary culture, ideas and identities all different from each other. Janet Goldstein: Janet is a Montreal artist specializing in abstract art. It uses a wide variety of mixed products such as acrylic, sprays paint or gel to name a few. Janet is self-taught and is not afraid to mix things on her canvases. She likes to create depth and texture to her pieces.